Where do the Atlanta Falcons play their home games? The Atlanta Falcons play their home football games at Mercedes-Benz Stadium which opened August 26, 2017. The current LA Chargers Stadium is the StubHub Center in Carson California. The StubHub Center address is 18400 Avalon Blvd, Carson, CA 90746. Turkey, stuffing, pies galore and watching the Dallas Cowboys is a tradition not only in Dallas but Nationwide. So are there any Dallas Cowboys Tickets Thanksgiving Day Best Deals? Do you know how many Super Bowls the Rams won? Do you know how many Super Bowls the Rams have won? The Rams have won one Super Bowl (as the St. Louis Rams) back on Sunday, January 30th 2000 at the Georgia Dome in Atlanta for Super Bowl XXXIV defeating the Tennessee Titans 23-16. The Rams finished the 1999-2000 season with a 13-3-0 record giving them 1st in the NFC West Division, also finishing 1st out of 31 teams in points scored with 526 total and 4th out of 31 NFL teams in points allowed with 242. During their Super Bowl win the Rams were led by 28-year-old number 13 Kurt Warner under the center who went 24 of 45 for 414 yards with two touchdowns. Isaac Bruce the Rams all-time receiving leader caught six receptions for 162 yards, one touchdown with his longest reception of the game going for 73 yards. During the Super Bowl the St. Louis Rams scored first off a Jeff Wilkins 27yard field goal with 3:00 minutes left in the first quarter. In the second quarter Wilkins extended the Rams lead over the Titans with a pair of field goals, the first at the 4:16 mark and the second with just 0:15 seconds left till half. The Rams took a 16-0 lead over Tennessee in the third quarter on a nine-yard touchdown pass from Kurt Warner to Torry Holt followed by Jeff Wilkins hitting the extra point. The Titans were able to stage a comeback tying the game with 16 unanswered points. With 14 seconds left in the third quarter Tennessee Titans quarterback Eddie George scored on a one yard run to close out the third quarter. In the fourth quarter Eddie George ran in for a 2-yard touchdown with 7:21 seconds left to go in the quarter, Al Del Greco kicked the extra point. With 2:12 left to go in the Super Bowl Al Del Greco tied the game on a 43-yard field goal. 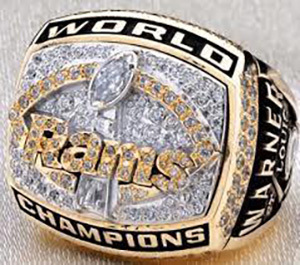 The St Louis Rams got the ball one more time and with 1:54 left in the game QB Kurt Warner connected with Isaac Bruce on a 73-yard touchdown pass followed by a Jeff Wilkins extra point kick giving the Rams their first Super Bowl win 23-16. Kurt Warner was the Super Bowl MVP. Chargers tickets promo code from the Official Barry’s Tickets website is available now. With over 1000 physical San Diego Chargers tickets for their home games at Qualcomm Stadium Barry’s Tickets offers something to fit every fan. You can use our Charger tickets promo code throughout the entire season. No matter if the Chargers are playing fellow AFC West rivals the Broncos, Chiefs or Raiders or any other regular season team you can save on your tickets today. 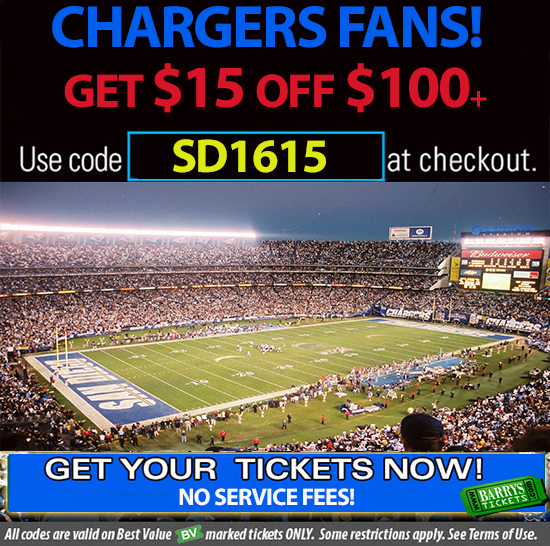 Get $15 Off $100 or more Chargers Tickets Promo Code! Valid San Diego Chargers Tickets during the regular season at Qualcomm Stadium. This San Diego Chargers Tickets Promo Code is valid only on Chargers tickets marked BV. Games and code are subject to change. Valid while supplies last. Get your Chargers Tickets today! Use SD1615 at checkout. Get $25 Off $250 or more Chargers Tickets Promo Code! Get your Chargers Tickets today! Use SD1625 at checkout. Use our Rams Tickets promo code for all LA Rams home games at the LA Coliseum, as well as their new stadium, being built in Inglewood California. The Rams left Los Angeles for St Louis in 1994 and had once again returned to the sunny Los Angeles sky’s to play their home games. Each season the Rams will meet fellow NFC West teams the Arizona Cardinals, Seattle Seahawks and San Francisco 49ers on the gridiron. Barry’s Tickets has been offering great deals on Rams tickets since 1985 both in Los Angeles and St Louis and now is your chance to finally catch an NFL pro football game again. Use our Rams Tickets Promo Code to save on your order. You can also choose FREE PICKUP of your Rams tickets at one of our Los Angeles locations to save even more money on your tickets. All of Rams Tickets at Barry’s Tickets are guaranteed to be 100% authentic tickets and delivered to you on time. 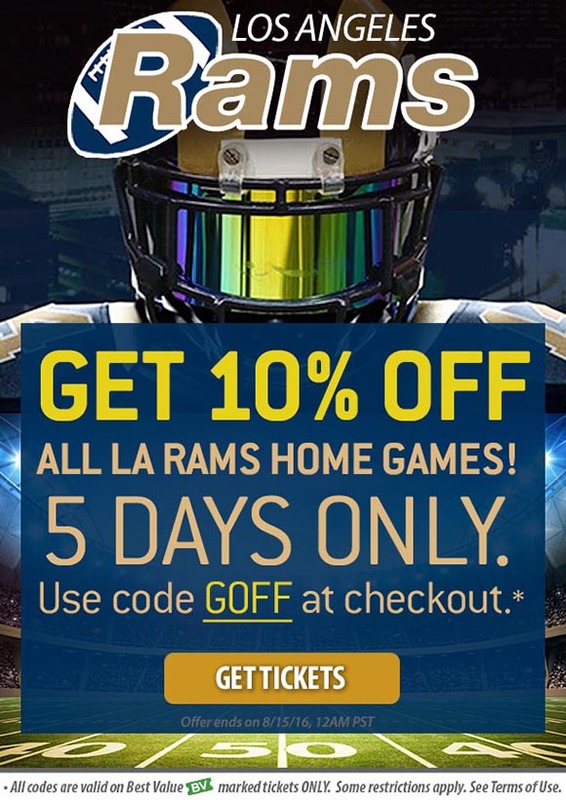 Get 10% Off LA Rams Tickets Promo Code! Valid on Rams Home Game Tickets. This Rams Tickets Promo Code is valid only on LA Rams Tickets tickets marked BV. Games and code are subject to change. Get your RAMS TICKETS today! Use GOFF at checkout. 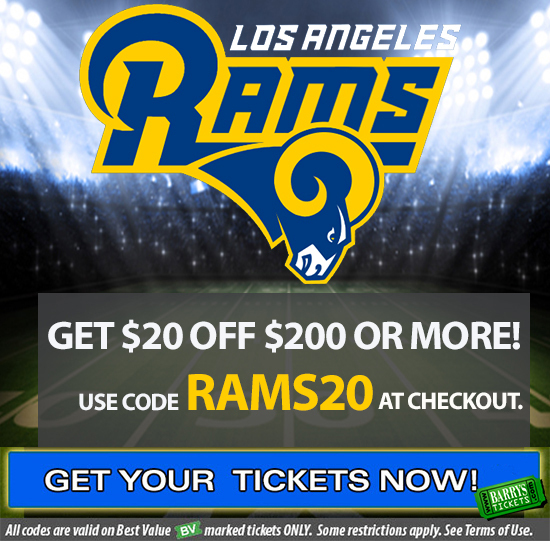 Get $20 Off Rams Tickets Promo Code! Valid on Rams Home Game Tickets. This Rams Tickets Promo Code is valid only on Rams game tickets marked BV. Games and code are subject to change. Get your LA RAMS tickets today! Use RAMS20 at checkout. Whether you bought your Superbowl tickets from Barry’s or are watching at home here is a great Clam Chowder recipe to keep you warm and make you feel like you are in the city by the Bay. 5 cups diced baking potatoes. I roughly peel them. I think some peel is nice.